UPDATE: Labor leader Bill Shorten has confirmed the resignation of long-serving senator Stephen Conroy with a statement honouring him. Mr Shorten, who is currently in Canada, said he had spoken to Mr Conroy about the shock low-key resignation in parliament on Thursday night. "He has told me he has decided it is time to put his wife and daughter who he loves so much first," the statement said. "He goes with my goodwill, my best wishes and my thanks for his advice." EARLIER: LONG-serving senator Stephen Conroy has resigned from the Australian Senate in a late-night, quiet moment in parliament. The Victorian senator shunned a public announcement and instead tabled a speech in parliament to announce his resignation. The frontbencher did not read the speech out. He asked for it to be tabled instead so the senate could "move on". "As it is very late, I seek leave to table the rest of my contribution so we can move on," he told the senate. At 8.53pm on Thursday, the speech was tabled and has now been published as part of the parliamentary record Hansard. "You should always go out on top," Conroy wrote in the speech. "This week as Captain of the Parliamentary Soccer team I scored a hat trick. It must be time to say farewell." Mr Conroy highlighted the content of his first speech back in 1996, which called the changing structure of the Australian workforce Labor's next challenge. "We are seeing a growing gap between the information rich and the information poor," his original speech said. The former Minister for Communication said the greatest contribution of his 20-year career was the National Broadband Network before moving on to announce he would not be in parliament. "As Opposition leader Bill has shown what I have always known - he is a resilient, smart, warm man of the people and for the people. He is Australia's Prime Minister in waiting," the speech said. "I'm sorry I will not be alongside you in the Federal Parliament as youtake your place in history." 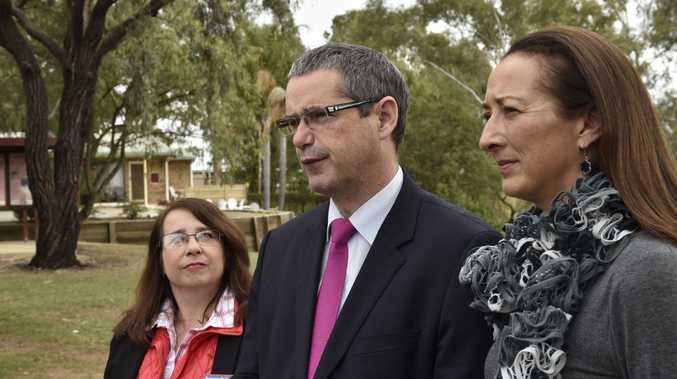 Mr Conroy's Labor colleagues were caught out by the shock announcement. Labor deputy leader Tanya Plibersek appeared not to know about Mr Conroy's resignation when asked about it during a press conference in Sydney on Friday morning. She was one of several Labor colleagues Mr Conroy highlighted in the speech, alongside Wayne Swan and Jenny Macklin, as strong friends. He also paid tribute to Julia Gillard and said it had been a privilege to serve under the country's first female prime minister. Labor leader Bill Shorten is currently in Canada addressing the Global Progress conference.